Are Foods Labeled Healthy Actually Healthy? If you’re trying to maintain a healthy lifestyle, a trip down any grocery store aisle can be overwhelming. Foods claiming to be full of antioxidants, low in sugar, or made with whole grains can make it challenging to figure out what is a “healthy” option and what might be something to just walk on by. She takes a look at some common foods that many think are healthier options to see what’s behind the packaging. “Protein or energy bars are never something that I’m going to encourage people to add to their diet, unless someone is having a hard time taking in enough calories or protein from real food,” says Bosscher. Athletes who are eating regularly but need a grab-and-go snack are one example she offers where a protein or snack bar may be reasonable. Otherwise, if you need a grab-and-go snack, consider almonds, fresh fruit or even a PB&J on whole grain bread And consider keeping a few alternatives stashed in your bag if you know you’re going to be out running errands, or even traveling – like on a plane. If you do find yourself faced with limited snack options, keep in mind the short ingredient list rule and find one that only has nuts, fruit or other whole foods. Bosscher says that if you’re eating just a few fruits and vegetables each day, you’re probably getting plenty of vitamins. Even a CDC study found that the average American consumed more than the Recommended Dietary Allowance of several vitamins. But there are times where Bosscher has recommended them. It’s hard to tell sometimes whether dried fruit should be avoided because of high sugar content, or if they can fit within a healthy diet. Bosscher notes that like many foods, it all depends on portion size. Keep in mind that certain dried fruits, like cranberries, have added sugars to counter their natural tartness. In those cases, stick with raisins or unsweetened dried apricots instead (and bonus – they can be an easy and portable snack instead of those energy bars). Trying to determine whether smoothies fall into a healthy category is a little more complicated. They have fiber, which is important, but using juice or including too much fruit can easily overload your snack with sugar. And, many of the smoothies found on store shelves have as much if not more sugar than many sodas. Bosscher’s recommendation is to make your own. “A simple recipe is to include a protein source – like plain yogurt, tofu, milk or peanut butter - leafy greens, water or milk – instead of juice – and fruit,” she says. When it comes to the fruit, restraint is best. It can be tempting to add several types – the more the healthier, right? But Bosscher suggests limiting the amount to no more than two cups. As for the amount of smoothie you make – stick with a single serving of 8-12 ounces and share the rest or save it for the next day. When it comes to juice, Bosscher recommends limiting it to a ½ cup (or 4 fluid ounces) per day. Some may think fruit juice is healthy – it’s fruit after all – but it is missing the fiber found in whole fruits. Fiber plays an important role in blood sugar control, even for someone without pre-diabetes or diabetes. A quick look at the yogurt section and it’s easy to be overwhelmed – French, Icelandic, Greek, not to mention organic, grass-fed and more. How do you decide which variety is best? She points to the “protein trend,” where even breakfast cereals are fortified with it. But more isn’t always better. “There is such a thing as too much protein,” she comments. Bosscher notes that the other benefit of yogurt is that it is a good source of calcium. That can be beneficial for teens who may begin to replace milk with soda or juice. 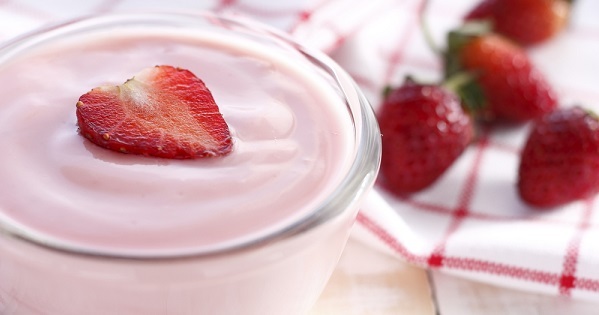 Yogurt can be an easy way to meet about one-fourth of a teen’s daily calcium needs. Granola has long been viewed as a health food staple, and it can be a good option as long as you keep a few things in mind. When you make your own granola, you can control the sugar, fat and spices. Bosscher shares her recipe for homemade granola. Bosscher likes to make her own granola, that way she can control the sugar and fat. Even when you do, be mindful of your portion size. One-fourth cup to 1/3 cup seems small, but it’s plenty because of how calorie dense granola tends to be. It can be easy to overdo it, so do help train your eye for appropriate portions by taking out your measuring cups and seeing how ¼ cups looks in your bowl. Stop in any snack aisle and chances are you’ll find a wide variety of vegetable or even fruit chips. But are those sweet potato chips any healthier than potato or tortilla chips? It depends on how they’re prepared and what’s in them. Some vegetable chips are actually corn tortilla chips combined with a particular vegetable – like sweet potato. So it is important to read the packaging carefully. You’ll also find root vegetable chips, typically sweet potatoes or beets. They still contain calories, salt and sugars so it is still important to consider what a true serving size is. There is some benefit in that they contain more fiber, so you feel a little more satisfied, but again, moderation is key. “Just because they are vegetables, you probably don’t want to treat them like a ‘free food’,” comments Bosscher. Alternatively, roasted seaweed chips or kale chips can be a lower calorie alternative and extra bonus - are easy to make at home. There are a number of sugar alternatives available on market shelves that are often billed as a healthier alternative to white sugar. But despite marketing labels, it’s important to remember that raw sugar, coconut sugar, honey and agave nectar are all still sugars. And rather than turn to chemically altered sugars like sucralose or even stevia, Bosscher has a different recommendation. “We could all stand to train our taste buds to be satisfied with less sweetness, not more. So reducing all sweetners, if only slightly, is a healthy goal,” she comments. Low-fat alternatives have been around for quite some time, but just because something is low fat doesn’t mean it is better. There is even some research that suggests the lower fat alternatives to products may be unhealthier because they make up for the loss of fat by adding sugars. But Bosscher says it’s not a simple recommendation. “It’s difficult to offer a ‘general rule’ when it comes to low-fat products. There are some people who can eat full fat varieties, like whole milk, and be fine. And it depends on what the product actually is,” she says. Bosscher, who works with cardiology patients, notes that she would not recommend full-fat dairy to most of her patients because it is important to reduce saturated fat in their diets, which can help lower LDL cholesterol. On the other hand, packaged foods that are labeled low-fat make her wary. Bosscher wryly points out that focusing on fruits and vegetables helps you stay away from misleading packaging. But in the end, she acknowledges busy lifestyles really do make it challenging. And even for individuals living on their own, the thought of preparing meals may seem daunting. But it’s important to focus more on real food. “Processed, or packaged foods, span a whole range of items. But the more we can rely on ‘real foods’ – fruits and vegetables, for example – the better off we’ll be,” she comments.